The Association of Fundraising Professionals’ (AFP) annual awards program recognizes outstanding achievement by individual, foundation and corporate philanthropists, fundraising volunteers and fundraising professionals. 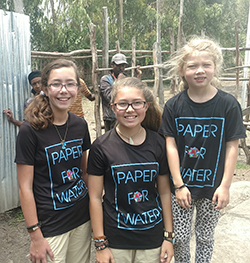 Isabelle, Katherine and Trinity Adams—sisters from Dallas, Texas, aged 14, 12 and 8, respectively, and who have raised more than $1.5 million to provide clean water to children in developing countries—have been named the 2018 CARTER Outstanding Youth in Philanthropy, Group, by the Association of Fundraising Professionals (AFP). In philanthropy, such individuals and organizations form a vital partnership with charities and the nonprofit sector to ensure that the needs of all citizens are met. It is right and proper, therefore, that AFP honors those who hold high ethical standards and best exemplify commitment and dedication toward helping society. A Note About the AFP Awards Committee: All awards recipients are chosen by the AFP Awards Committee. The committee reviews each application received by the stated deadline that satisfies all criteria. Due to the large number of entry forms submitted, the committee does not provide chapters or other applicants with an evaluation of their entry once the process is completed. If, in the judgment of the committee, no application for a particular award meets the stated criteria, no award will be given. The committee works to establish consistent criteria for each award. (April 1, 2019) AFP has awarded the 2019 Skystone Partners Prize for Research on Fundraising and Philanthropy to Michael Moody and Sharna Goldseker for their book Generation Impact: How Next Gen Donors Are Revolutionizing Giving. (March 31, 2019) Paul Pribbenow, Ph.D., CFRE, president of Augsburg University in Minneapolis, Minn., has been named the Outstanding Fundraising Professional by the Association of Fundraising Professionals (AFP). (March 6, 2019) Jamie Cleghorn and Max Armstrong, two friends who have raised hundreds of thousands of dollars to send kids with type 1 diabetes to Diabetes Canada’s D-Camps, will receive the 2019 CARTER Award for Outstanding Youth in Philanthropy, Group, presented by AFP. (March 5, 2019) Lizzie Allison, a 17-year old young woman who has raised tens of thousands of dollars to help foster kids celebrate birthdays, has received the 2019 CARTER Award for Outstanding Youth in Philanthropy, Individual, presented by the Association of Fundraising Professionals (AFP). (March 4, 2019) Channing Lenert, Jonathan J. Richardson and Juliana M. Weissbein are this year’s Outstanding Young Professionals and will be honored at AFP ICON 2019 in San Antonio on Tuesday, April 2. (April 11, 2018) The Association of Fundraising Professionals (AFP) has awarded the 2018 AFP/Skystone Partners Prize for Research on Fundraising and Philanthropy to Beth Breeze for her book, The New Fundraisers: Who Organises Charitable Giving in Contemporary Society?, published by Policy Press, in 2017. (April 4, 2018) AFP is proud to announce its 2018 group of Outstanding Young Professionals, fundraisers under the age of 31 who have already show exemplary work in raising funds, inspiring donors, helping manage campaigns and giving back to the profession. (Mar. 27, 2018) Isabelle, Katherine and Trinity Adams—sisters from Dallas, Texas, aged 14, 12 and 8, respectively, and who have raised more than $1.5 million to provide clean water to children in developing countries—have been named the 2018 CARTER Outstanding Youth in Philanthropy, Group, by the Association of Fundraising Professionals (AFP). (Mar. 20, 2018) Ava Goldstone, an 18-year old young woman who has helped to raise hundreds of thousands of dollars and volunteered countless hours to support children with disabilities, has been named the 2018 CARTER Outstanding Youth in Philanthropy, Individual, by the Association of Fundraising Professionals (AFP). (Mar. 8, 2018) Lynn Croneberger, chief executive officer of SOS Children’s Villages-USA, the U.S. Headquarters of SOS Children’s Villages International, has been named the 2018 Outstanding Fundraising Professional by the Association of Fundraising Professionals (AFP).